The primary focus of the Energy Theme is on reducing the energy consumption of cloud computing resources. As compute nodes consume most of the energy in cloud computing systems, work to date has been focused on reducing the energy consumed by compute loads, particularly within the Openstack context. Although, as servers get increasingly instrumented, it is clear that there is potential in understanding the energy consumption with finer granularity and ultimately this can lead to energy efficiencies and cost savings. In the current work, the primary mechanism to achieve energy efficiencies is load consolidation combined with power control of servers. This could be augmented with managing server CPU power states, but it remains to be seen if this will lead to significant power savings. Another tool to achieve energy efficiencies is to add elastic load when the resources are underutilized – this does not reduce the overall energy consumption per se, but rather enables providers to get more bang for their energy buck. 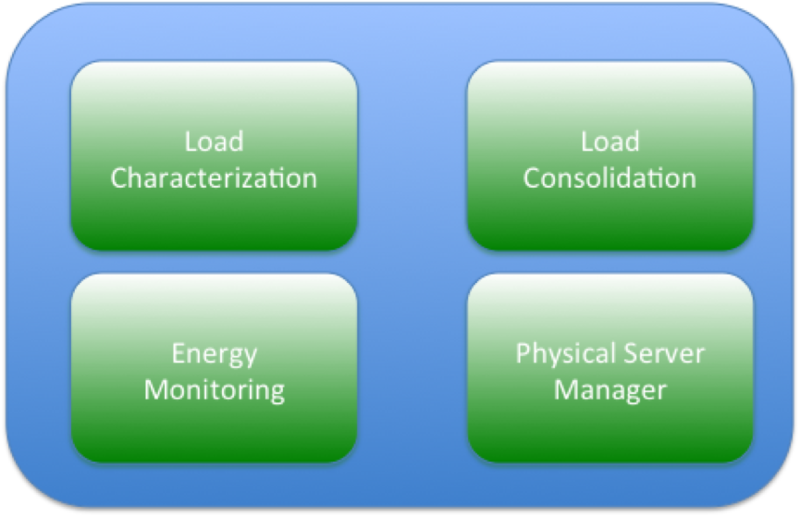 physical server manager: this will turn off servers and turn them on as necessary – this will take input from the load characterization component to determine how much spare capacity to keep in the system to deal with variations in demand. The specific interactions between these components is evolving as this is a work in progress.